May, for me, was a rather disappointing month – having had to give up a trip to South America with my dear friends at the last minute got me a bit more down than I expected. Still, I had some fun work shooting outside for these cool people and the arrival of summer has definitely been cheering me up. I’ve been spending time in the garden growing fruit and vegetables – my least favourite part of which is battling against snails! Scattering egg shells and using copper tape around the bed seems to be doing the trick so far (I don’t like the idea of using pellets), but please let me know if you have any other tips. But apart from that, it is therapeutic and our cat loves munching salad leaves from the ground too. Encouraged by this gorgeous weather, I started getting into more ‘churning’ action too :) I was looking for some new flavour combinations and couldn’t resist trying out a couple that I found in Tessa Kiros’s beautiful book, Venezia. The first recipe I tried is Zabaglione ice cream. Being a custard fanatic, it’s no wonder I love Zabaglione – you can add other flavours like vanilla, cinnamon or lemon zest, but as Tessa says I like mine simple too, making it just with egg yolks, sugar and Marsala, served still warm. It reminds me of when I tasted it in Rome where it was served with wild strawberries. Although I knew this flavour was going to work as ice cream, I was still excited to taste it and it turned out lovely indeed. Tessa’s recipe was rather on the sweet side, so I decided to stick to my basic recipe with an addition of berry swirl, an idea that I found in David’s book. It’s delicious on its own, or served with fruits. Place the milk in a saucepan and bring to a simmer. In a bowl, whisk the egg yolks and sugar until pale and thick. Pour the warm milk into the yolks, stirring constantly. Place the mixture back in the saucepan and put on a medium heat, constantly stirring with a wooden spoon until the custard thickens and coats the back of the spoon. Strain into a clean bowl, cool over ice-cold water then add the double cream and Marsala. Chill the mixture in the fridge, churn in an ice cream machine according to the manufacturer’s instructions. Make the berry swirl just before churning the ice cream. Puree the fruits and sugar in a blender, strain through a fine sieve. Add the vodka. 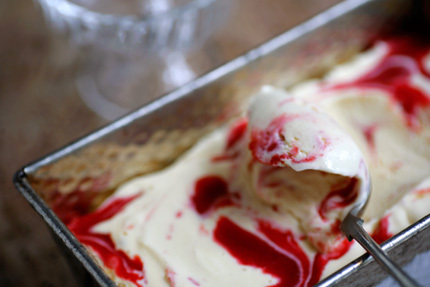 When the ice cream is ready, pour into a container, layering and swirling the puree into it as you go along. To make the ice cream, place the lemon zest and sugar in a saucepan with 120ml water, bring to the boil to dissolve the sugar. Simmer gently on a low heat for about 10 minutes until it’s syrupy. Strain through a sieve and discard the zest; cool the syrup then add the lemon juice. Add the double cream and chill the mixture in the fridge, churn in an ice cream machine according to the manufacturer’s instructions. To make Sgroppino, you need to make the ice cream the day before so that it’s firm enough not to melt too quickly. Just scoop the ice cream into a blender, add the prosecco and vodka and whiz briefly. Serve immediately. What great story and pictures as usual; you are fantastic. Love your Blog! such wonderful spring photos of your garden. 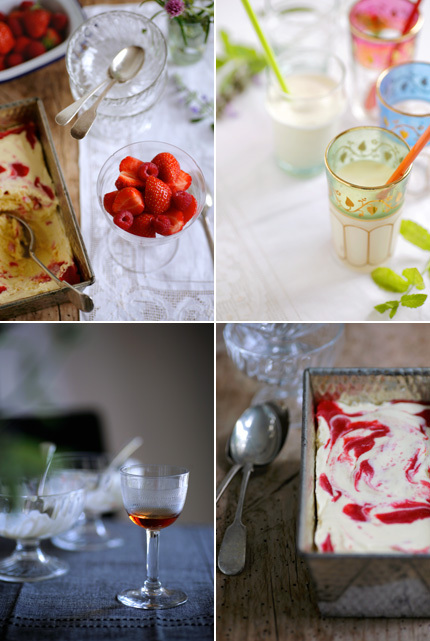 i am also a custard fanatic and these look amazing. glad you are back with a new post! As always, the pictures are gorgeous. And I can’t wait to try that recipe! It’s been unseasonably cold here, so it can be something for me to look forward to. love your photos! and that ice cream looks perfect for summer! enjoy! Simply gorgeous. Always so much inspiration here, Keiko. I love Tessa Kiros’s Apples for Jam, and I don’t think I’ll be able to resist buying this one as well. I just got an ice cream maker, and this is the perfect recipe to make. I am so excited. I love your photographs. Simply beautiful. Your garden look beautiful Keiko chan and your ice cream too! I don’t have ice cream machine, but I will try to do this recipe manually, thank you for sharing and have a nice summer! I love the sound of that zabaglione ice cream!! Hi Keiko! 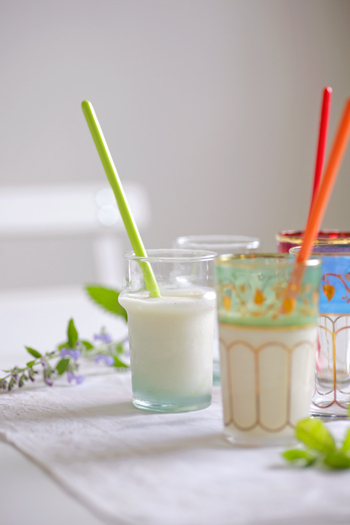 Beautiful pics as always… I love zabaglione and I agree with you about limoncello instead of vodka! I didn’t even know that Tessa Kiros had a new book out, how exciting! Thanks too for the reminder of just how lush and lovely a Sgroppino can be. I look forward to enjoying one very soon! Incredible photos, always an inspiration! Never miss your blog. I love sgroppino’s and have made them with lemon sorbet, I will have to try with lemon ice cream or sherbet. Really gorgeous pictures! I do ice cream every weekend now (fruits are so delicious!). I’ll try Zabaglione, it seems easy and tasty! I’ve always loved the lemon sorbet & Prosecco concoction, but just never knew it is called Sgroppino. The version with ice-cream sounds, and definitely looks, lovely, too. I’ve recently been pointed to a website for Japanese people living in the UK　where you share your recipes with photos. I didn’t know you are a contributer there! Intersting ones indeed. ohh keiko as always your post is breathtaking! I love the Tessa Kiros book too and also use limoncello in my Sgroppino instead of Vodka. Must try to make the lemon ice cream – I usually just get it at the ijssalon near my house but you make it sound so easy! Love your site.Wonderful pictures and recipes. Thank you. As for the snails and slugs-Beer, the least expensive beer you can find. Place jar lids or I use Styrofoam cups and bowls cut down to 3-4cm.and placed into the ground so the edge is just above ground level. Fill with beer. Empty and rinse out every few days until the colonies are depleted. Hi all, thank you so much for your kind notes as always. Lara, Rebecca, Mari, Valisa – I love her ‘Piri Piri Starfish’ too, it’s about the food in Portugal and really lovely. Aran, Shereen, Manggy, Eva – the garden is actually my client’s, it’s a beautiful country garden and I wish I had one like it! Manggy – I know, basil seems very popular with snails! Ahmcguffin – thank you so much for the tips, I might try it but I’m not sure if I can handle dealing with even the dead slugs (I’ll scream and run away)...! I was actually going to tell you the same thing about using saucers (or plates with shallow edges) of beer…we did this in my garden growing up and it worked wonderfully! I know it’s gross, but definitely the easiest thing we ever tried. Wow! sounds delicious…pictures are gorgeous. Your blog always inspires me. Tessa’s book is beautiful, I just look, not really cooking from it. The ice cream looks amazing, and I love your cute lanterns in the garden. It’s too bad you had to miss out on your trip… hopefully your summer only improves from this point! Your photography is truly stunning, and I’m always excited to see a new post on Nordljus. Thanks for sharing! Though your stunning food are always welcome for my eyes. You made a beautiful red pattern for ice cream (which I had done similar thing before and had not happen like you did). Really take care and enjoy the summer! i discovered your blog a while ago and I am always impressed with your beautiful work! Very inspiring! fantastic photos as usual. Really captured the essence of the season.Love the woodland shot. Oh, so glad to see the new post. Amazing photos as usual. Excited to try the ice cream AND pass on the recipe to my father! Such a beautiful photos Keiko. I’ve always love Zabaglione, and to turn this into Zabaglione ice cream is such a brilliant idea. i admire your blog since I discoverd it and i look from time to time to see your wonderful photos and your marvellous and unique taste. BUT although i have friends in Venice and fly often there I NEVER GET from them the recipe from SGROPPINO. Thank you so much for it. I´ll try it this weekend. I´m spanish and live in Cologne. Some time ago there was a wonderful japan patissier girl who works for “Törtchen Törtchen” ( a nice place to get cake) and since she is gone the fine taste is away. Germans don´t get the balance for the sweetness and the other tastes. Pity. But I must think of you and your TASTE. Funny, isn´t it? dreamy, so dreamy. loved every moment of it! beautiful photos Keiko. As I was reading the post I thought Limoncello would be nice here and you were thinking the same. Sgroppino was a hit last weekend!!!!! My husband put a bit more of Vodka but not much and the taste is genuine the original one. Maybe in bars they put less creme double or change it for milk cream. But I definitely prefer it as you wrote with 250 gr. Creme double! UNBELIEVABLE pictures – looks like you’ve got a great garden going there, and oh, the food! I love your photos, they’re amazing! They are just the kind of photos I love to look at, and that I would like to be able to take myself. I am just getting into photography and am looking at getting a DSLR camera. What kind of camera do you have? Lovely to see your beautiul pictures again Keiko. It makes me want to get to the garden too! I love your pictures. (and your blog) :) Thanks for sharing it with us. Wow, I don’t know how I got here but I love it! Beautiful site, beautiful imagery. It’s been a dreary week here in Mtl & then I get to see this blog! Happy days again! lol. Lovely, thanks for making my day. Can you share with me, info on what camera you use? Those photos are inspiring and simply beautiful ! I want to test the icecream !!! Please tell us where your “Happy Glasses” come from! They are beautiful..as is your site! What a dream it would be to have a dish of this incredible ice cream while enjoying your enchanting garden! Such a beautiful and inspiring post! Snails and slugs? In the USA we have a product called “Sluggo” (TINY iron sulfate-based pellets) that is supposed to be OK for organic, not toxic to pets and actually fertilizes plants. The pellets are under a quarter-inch long, dark colored and unobtrusive. There’s also the old shallow pan or dish filled with beer (in which they drown). If you don’t have beer, you mix water, a little flour, a pinch of yeast and a little sugar and put that in the pan. HI. I love your beautiful yummy blog! I have been meaning to write and let you know I added you to my new food blog sidebar recently & enjoy going to your blog as a daily read. Just wanted to stop by and introduce myself! Have a great day. Keiko, I’m so glad the summer months are warming your spirits. I love the pictures but it’s hot and humid in Florida so the Ice Creams are very tempting right now. Hi everyone, thank you so much again for all your kind notes. Brittany, sj – thank you so much for your tips, my copper tape seems to be doing the trick so far, but I’ll try your methods when they are back (I’m sure they will, eek!). Foodie Notes – your balcony sounds wonderful, it’s amazing how much you can do with a small space, isn’t it? I never thought I’d be into gardening, but it really is rewarding. Natsumi-san – keep inspiring us with your beautiful creations, I really enjoy seeing things through your eyes. Sj – how lovely that your father makes ice cream! Barbara – you can enjoy limoncello soon too, we’re thinking of you. Margot – thank you so much! Karen, Chantal, Eatingmachine – I’ve been using a Canon 5D for two years now (a Rebel XT before that), with a 90mm macro lens for most food shots. Kristin & Chris Ann – I believe I got them from Graham & Green in London (http://www.grahamandgreen.co.uk/) but you can find similar ones at Middle Eastern/Moroccan shops. Lisa – it’s actually my client’s garden, I wish I had one like it! Miss A – thank you for letting me know! this is a bit late. but, you can get rid of snails by putting out little dishes of beer overnight. snails, slugs and pill bugs go right for it. it’s a bit icky in the morning. just throw it on your compost pile!